Thinking about that one. Not quite sure how to answer it. 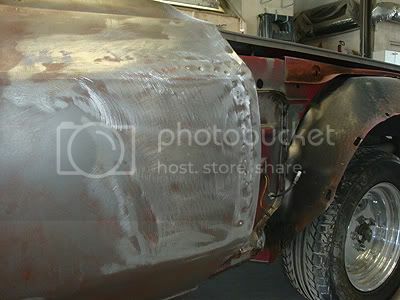 Soooooo lets say the bumper is going to be very shiny like chrome but the process is done black in color. motivation is the easy part it is telling my back to get started that makes it hard. 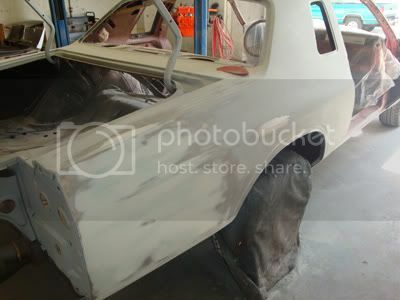 If my back could cash the checks I am writing I would have put primer on the car last night!!!! 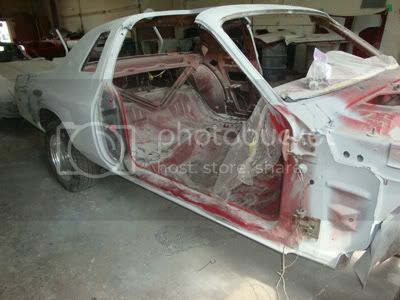 New photos of the car after soda blast. Note holes in doors showing someone at one point drilled holes to pull out the door. 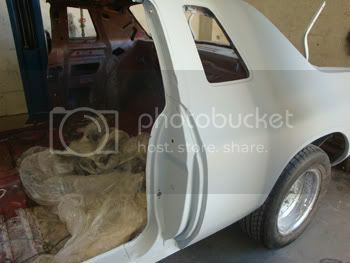 I will now need to pull the doors off and fill the holes in with metal. 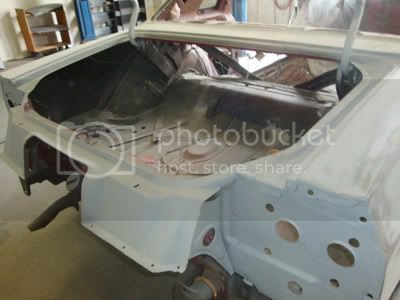 Deck lid has some minor damage but with a little metal that can be fixed as well. The front bumper shocks came out great. I will not need to buy new ones. I will just need to send the rear ones over to be blasted. That was a bonus. 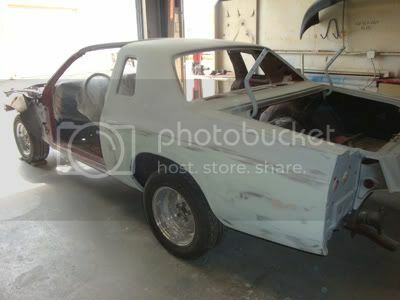 Primed , remove doors for later fix , replaced the metal in the lower half of the drivers side rear qtr panel. I am loving the results. The car is cleaning up nicely !! 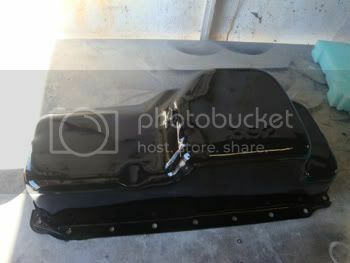 I do need help finding valve covers and a air cleaner that can be sanded and painted. I will not be able to use chrome or aluminum. 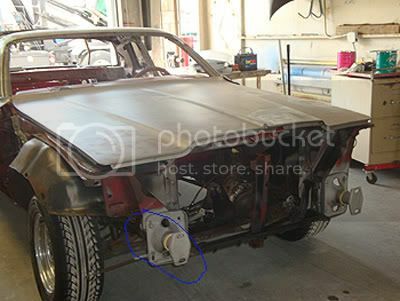 I have the stock valve covers but they have a bracket they would need to be cut off and made to look pretty. I would like to have one that does need the work. Any help would be appreciated. Last edited by magnumfan; 11-05-2010, 04:37 PM. Thank you - I am loving this project !! Looks like your doing some nice work. Thank you - the car has been easy to work with. For the most part straight, I think I will only need to block this car 4 or 5 times. I will no more after this weekend. On a side note if you own an 1980 Aspen RT you have a rare model. I think production on that car in 1980 was around 1k. Have you ever check the Chrysler registry? 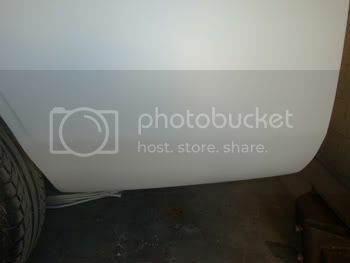 Magnumfan, I'm hoping to get to check out a h/l motor for you, and the "bar" for it. What else where you needing? I will send you a picture of the fan control as I am in need of one of those. 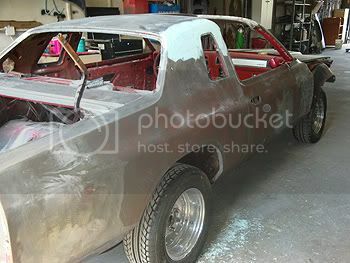 I am looking for interior pieces but if I can't find any I will wrap what I have. 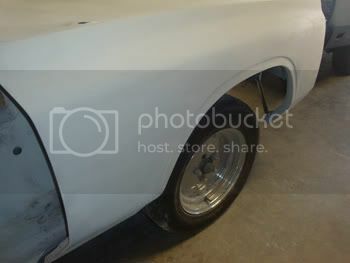 I need valve covers and an air-cleaner that can be painted. I think at this time that is all the hard to find parts I will need. If you know where I can get any of the above I would be very happy camper. 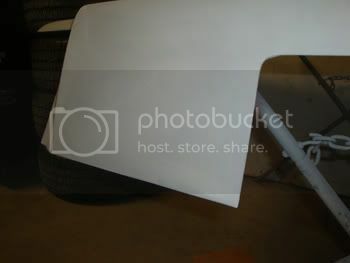 Great Weekend - I was able to block out the car and play with a little paint for the oil pan. The 2nd - 3rd and 4th block should come around this week. Replace floor board in the morning and look at putting down some red primer by next weekend. 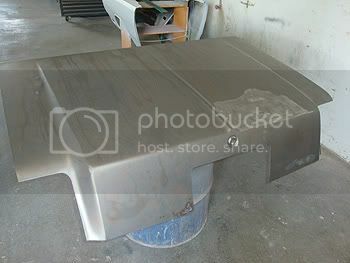 The deck lid image is from where I needed to add metal . Came out good.